University of Nebraska Press, 9781496206305, 270pp. 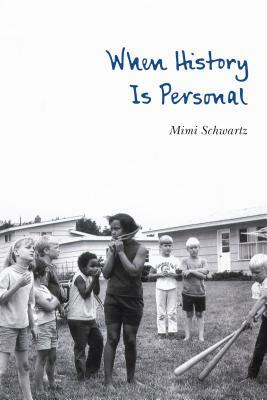 When History Is Personal contains the stories of twenty-five moments in Mimi Schwartz’s life, each heightened by its connection to historical, political, and social issues. These essays look both inward and outward so that these individualized tales tell a larger story—of assimilation, the women’s movement, racism, anti-Semitism, end-of-life issues, ethics in writing, digital and corporate challenges, and courtroom justice. A shrewd and discerning storyteller, Schwartz captures history from her vantage as a child of German-Jewish immigrants, a wife of over fifty years, a breast cancer survivor, a working mother, a traveler, a tennis player, a daughter, and a widow. In adding her personal story to the larger narrative of history, culture, and politics, Schwartz invites readers to consider her personal take alongside “official” histories and offers readers fresh assessments of our collective past. Mimi Schwartz is a professor emerita in the writing program at Stockton University. She is the award-winning author of Good Neighbors, Bad Times: Echoes of My Father’s German Village(Nebraska, 2008) and Thoughts from a Queen-Sized Bed (Nebraska, 2003) and is the coauthor of Writing True: The Art and Craft of Creative Nonfiction. Her essays have been widely anthologized, and ten of them have been listed as Notables in the Best American Series.